The SmartFlex Helical Curve display is one of many platforms attendees can see in action in Dorner Mfg’s booth No. C-1847 at PACK EXPO 2015, Sept. 28-30, at the Las Vegas Convention Center in Las Vegas. The SmartFlex Helical Curve conveyor, based on Dorner’s SmartFlex platform, is unique because it allows for tight turns in either ascending or descending application. Helical Curve conveyors are derived from the SmartFlex platform, a flexible chain conveyor that reduces costs saves time and offers simple configuration and acquisition options to Dorner’s customers within the food, medical, life sciences, industrial automation and packaging industries. Another one of Dorner’s newer platforms, the SmartPace conveyor, is designed to enhance packaged product orientation by receiving items and properly spacing them on the conveyor. 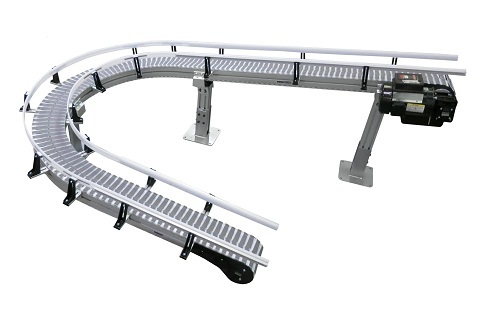 Debuting last year, the SmartPace conveyor uses HMI interface to control the spacing, speed, and orientation of products. What this advantage gives to users is the ability to merge multiple lanes together without product stops or gates – the entire process is smooth and seamless. Have to move a small part? Not a problem anymore, thanks to Dorner’s 1100 Series, which is perfect for moving small or lightweight products in extremely tight spaces. It features a compact design with a 3/4″ frame height, making it the smallest low profile conveyor available in North America. This low profile enables the conveyor to fit into tight spaces, freeing up valuable machine or worker space. In addition to the Helical Curve, SmartPace and 1100 Series, Dorner will also have its other major conveyor platforms on display at PACK EXPO, including its AquaPruf and AquaGard family of sanitary conveyors for the food and food packaging industries, as well as the 2200 and 3200 Series aluminum frame conveyors. Furthermore, Dorner is launching two other new major products at the PACK EXPO 2015. To see how all these conveyor platforms can help your material handling applications, make plans to visit Dorner in booth C-1847 at PACK EXPO 2015. For more information on Dorner’s conveyor platforms, visit www.dornerconveyors.com.